The main novelty is that you can compose e-mails with the same ease of use that you would have with a PC in an office setting--without taking your eyes off of the road or using your hands. You respond to e-mail by dictating out loud what you want to say while using voice commands for editing functions, such as deleting, moving, or replacing text. For millions of workers who otherwise waste a large percentage of their time driving every day, being able to send and receive e-mails safely while commuting would represent an obvious boost in productivity. The system, which BMW said in February could be sold as an option in production models within three years, is part of the company's plans to develop voice-activated commands to operate any function that drivers must otherwise activate today by hand. For example, the German luxury carmaker expects eventually to allow drivers to enter search queries on the Internet and to hear search results read out loud by using voice commands as well. Does it look like he's working? BMW's voice-to-text e-mail technology complements options that BMW already offers. 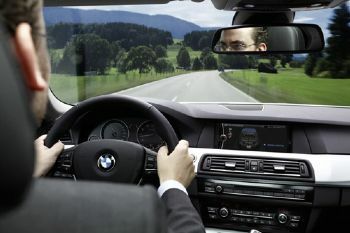 With BMW's ConnectedDrive, for example, you can connect your Blackberry to the dashboard console with a Bluetooth connection and the audio system reads e-mail or text messages out loud as you drive. When the car is not in motion, it is possible read the full texts of the e-mails from a Blackberry inbox on the car's dashboard screen. For the iPhone, BMW will offer an app with which drivers can open and lock their car remotely. Other carmakers are seeking to widen their in-car communications options as well, of course. In the mainstream car sector, Ford's Sync infotainment system allows for selected smartphone applications to run on a dashboard console. With Ford's MyFord Touch for Sync, drivers can select routes for GPS-guided navigation and music. Ford also plans for Sync to read e-mail and text messages out loud and to allow drivers to dictate messages in three to five years time, although it has not yet demonstrated a prototype that does this like BMW has. GM says it is developing a voice communications app for Android mobile phones that will let drivers send and receive text messages and Facebook updates using only their voices. GM said it plans to offer the system with its OnStar in-car system and service during the first half of the year and will offer the compatible smart phone apps through Android Market. A main issue with any of these technologies is safety, of course. In theory, anybody can type and receive e-mails in their car with an Android, Blackberry, iPhone, or other smartphone while driving. In the best-case scenario, technology that allows for hands-free e-mailing and using other office applications in the car may save lives while allowing you to continue to work while driving. It is also likely that driver distractions may one day become irrelevant in the not-so-distant future, when and if cars drive themselves as many futurists expect them to. However, in the meantime, I remain cautiously skeptical that even voice-to-text e-mailing and texting is totally safe, so I look forward to in-depth studies to clarify just how safe or unsafe it is.